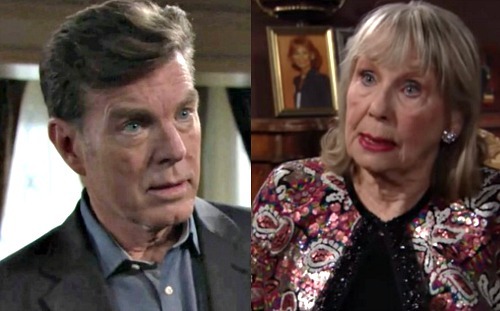 The Young and the Restless (Y&R) spoilers tease that Jack (Peter Bergman) has some serious bombshells headed his way. He’s already faced a few lately thanks to Ashley’s (Eileen Davidson) lawsuit, Kyle’s (Michael Mealor) betrayal and the discovery of an injured Victor (Eric Braeden). The hits will keep coming as Jack remains the focus of Paul’s (Doug Davidson) investigation. However, Jack’s about to face one blow that could devastate him more than all the rest. He may not be a true Abbott! Y&R has set up an intriguing mystery, so let’s recap what we know. Dina (Marla Adams) has Alzheimer’s, so her memory is a bit iffy right now. Her mind can’t be trusted, but Abby (Melissa Ordway) will become increasingly convinced that Dina has it right this time. It’s worth mentioning that Dina seems to remember events of the past far better than recent ones. During her interview with Abby, Dina recalled a hailstorm that occurred when she married John (Jerry Douglas). Of course, Abby had her doubts since the wedding happened in June. She was taken aback when Charlie’s (Noah Alexander Gerry) Internet search confirmed Dina’s claims. That shows us that Dina’s capable of recalling certain stories exactly as they happened. 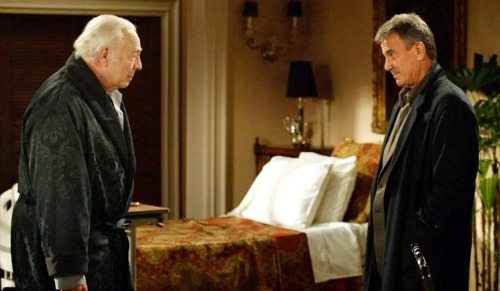 In Tuesday’s new Y&R episode, March 27, Dina also remembers going to the Stardust Inn with Jack’s father. She asks Abby to take her there and although she can’t remember the man’s name, she appears to have vivid memories of his face. The Young and the Restless hasn’t revealed the identity of Jack’s potential dad yet, but we should consider the worst-case scenario. Soaps tend to love long-lost sibling stories. Any character can be related to another character out of the blue. If that sibling is already a fierce enemy, that just makes a hot plot even hotter. 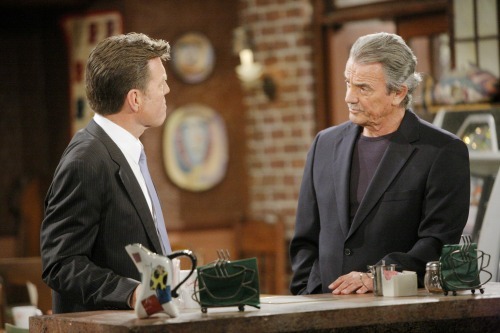 Y&R has also been revving up the feud between Victor (Eric Braeden) and Jack lately. You probably see where we’re going with this. Could these long-time adversaries actually be brothers?! It’s an interesting possibility to mull over. Victor’s father, Albert Miller (George Kennedy), abandoned him along with his brother and mother many years ago. Albert went on to amass quite a fortune and build a new life for himself. That new life could’ve included some steamy nights with Dina. Can you imagine the fallout of this shocking revelation? Jack would be horrified to learn that he’s not an Abbott, but the fact that he’s related to Victor would really push him over the edge. This could make their conflict even worse. Sibling rivalries are common, but Victor and Jack’s could go down as the nastiest in history! Do you think Albert Miller could be Jack’s father, too? The Young and the Restless spoilers say Jack’s world will come crashing down next week, so stay tuned for more answers. Let’s not forget that Mal Young said recently in a 45th anniversary promo that lives in Genoa City will be changed forever. We’ll give you updates as other Y&R news comes in. Stick with the CBS soap and don’t forget to check CDL often for the latest Young and the Restless spoilers, updates and news.